The American Gem Society (AGS) was created in 1934 by Robert M. Shipley, who also founded the Gemological Institute of America (GIA). The AGS was created to establish standards and ethical guidelines for the jewelry trade and, in turn, protect consumers. The AGS was a pioneer in establishing a cut grading system for diamonds and unveiled the industry's first in the early 1960's. Technological breakthroughs in the early 90's made it possible for the AGS to capitalize on their expertise in the field of cut grading and improve upon it. In the early 90's the AGS also saw a need for a laboratory to quantify and grade all the factors determining a diamond's overall beauty. The organization opened the Laboratory (AGSL) in 1996 and began producing the industry's first grading report with a cut grade. The AGSL produces several reports, the most common being the Diamond Quality Report®. See below for the types of reports. Shape and Cutting Style: Shape and style of cutting. Measurements: Dimensions and proportions in millimeters as measured by an optical measurement device. Carat Weight: Weight in carats measured by an electronic micro-balance. Color Grade: Color assigned as compared to the standardized (D - Z) color grading system when viewed in a controlled environment by several graders. Grade is assigned when a consensus has been reached. Clarity Grade: Clarity assigned as compared to the standardized (IF - I3) color grading system. Grade is assigned when a consensus has been reached among several graders. Cut Grade: A grade (0 - 10) assigned to the diamond after careful evaluation of the Light Performance, Proportion Factor, and Finish outlined below. Light Performance: A grade (0 - 10) assigned to the diamond after careful evaluation of the diamond's light performance utilizing sophisticated ray tracing computer models. Polish: A grade (Ideal, Excellent, Very Good, Good, Fair, Poor) assigned to the diamond's surface smoothness. Symmetry: A grade (Ideal, Excellent, Very Good, Good, Fair, Poor) assigned to the shape, alignment, and placement of the facets in relation to each other. Comments: Additional diamond characteristics and inscriptions not previously mentioned on the report, as well as any diamond fluorescence categorized as inert, faint, medium, strong and very strong. Clarity Plot: A map of the diamond's internal inclusions, their location and type as viewed under a micropscope. Proportion Diagram: A side profile of the diamond containing its actual proportions and measurements. The Diamond Quality® Document provides a complete diamond grading analysis of the 4c's: the diamond's cut, color, clarity, and carat weight. The first three of these factors, cut, color and clarity are each assigned a numerical score on a zero to ten scale, with zero signifying the most desirable rating and ten the least desirable. Diamonds meeting the AGSL's highest standards for cut, polish and symmetry are assigned an overall score of "IDEAL" and are referred to in the industry as "000". This report is the industry's only document that offers a cut grade for Round Brilliant, Princess, Emerald and Oval shaped diamonds. 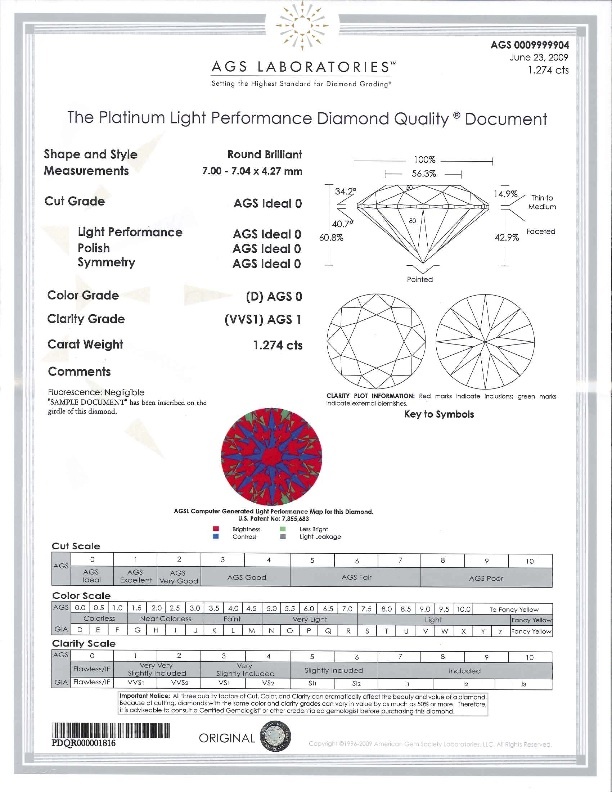 There is also a Platinum Diamond Quality® Document available which contains an AGSL Computer Generated Light Performance Map of the diamond. The image maps the brilliance, contrast and light leakage for that specific diamond. 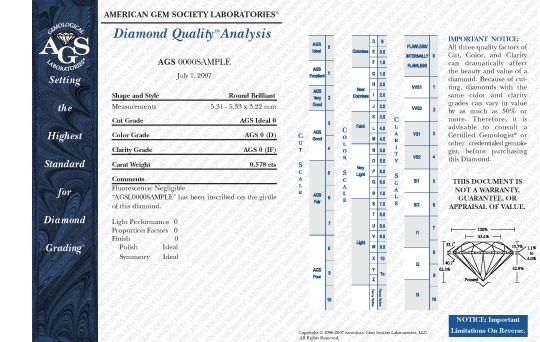 The AGS Diamond Quality® Analysis is a pocketsize diamond grading report for diamonds weighing under one carat. The report offers a complete analysis of the diamond's Cut, Color, Clarity, and Carat Weight. 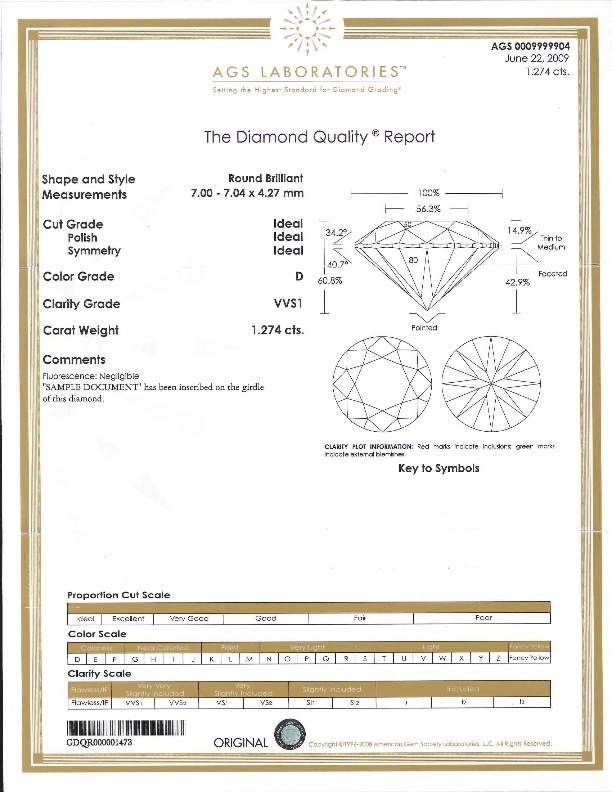 Instead of a diamond plot, the Diamond Quality® Analysis's unique identification number is laser inscribed on the girdle of the diamond. 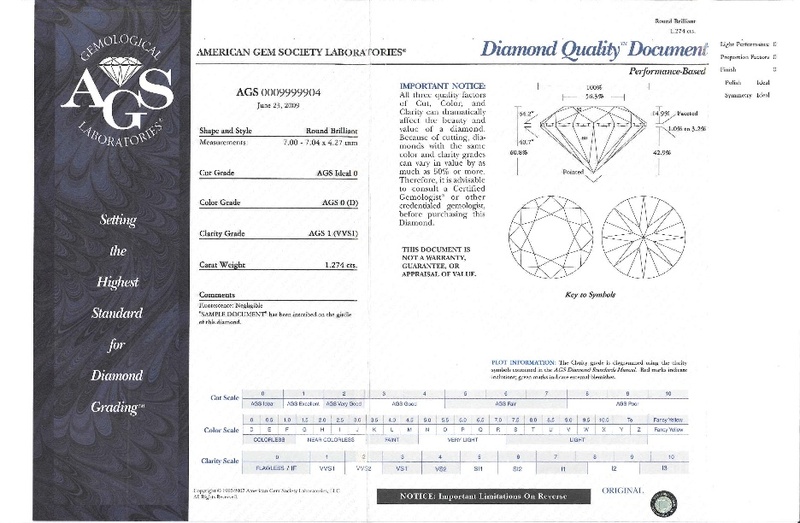 The AGS Diamond Quality® Report is a new proportion based report using the patented American Gem Society's light performace system. The report provides a complete analysis of the 4Cs: Cut, Color, Clarity and Carat Weight.